After you’ve had a chance to try out your Klout Perk, you may want to assign a rating and leave some feedback about the Perk you received. 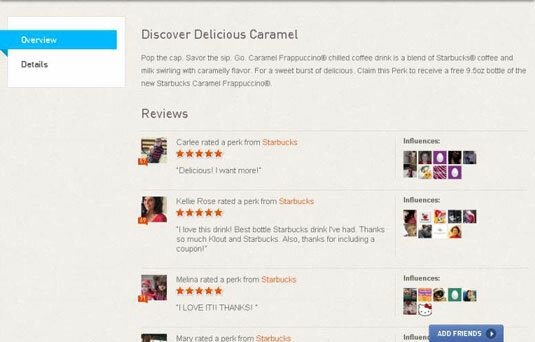 Klout will request your feedback a few weeks after you claim a Perk. Your feedback not only helps brands understand their consumer better, but also lets Klout know what kind of Perks are creating the best buzz. Navigate to your Perks menu in the upper right corner of your screen and select a feedback request. A pop up window appears. Provide the requested information to review your perk. Depending on the perk, your review options vary. Potential rating tools are listed at the end of these instructions. Click Submit to complete your review. A pop-up box appears that gives you the option to share this Perk. You may share at this time or click Continue to skip this step. You return to the original review page showing a check mark next to the statement Review this Perk. Your feedback is posted publicly in the feedback section for the Perk. To read more reviews, select the View Feedback link in this window. Close this box by clicking the x in the upper-right corner of the pop-up. Rate it. Choose the number of stars (from one to five) that you want to award to this Perk by hovering over each star until it turns orange and click. Review it. Leave written feedback in your own words about this Perk. Add a picture. Upload a picture of your Perk if you wish by clicking the Add a Picture button and uploading it from your hard drive.